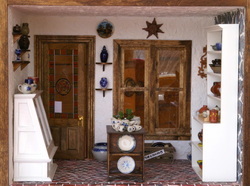 All of my pottery pieces are made by hand on a full-size pottery wheel, using tools I made myself. They are meant for a 1/12" scale dollhouse. I do not consider myself a production potter so all of my pieces can be considered one of a kind. This is a nice way of saying that if you like a particular piece, you'd better snap it up because there is no guarantee I can make another exactly the same. Nor do I particularly want to. 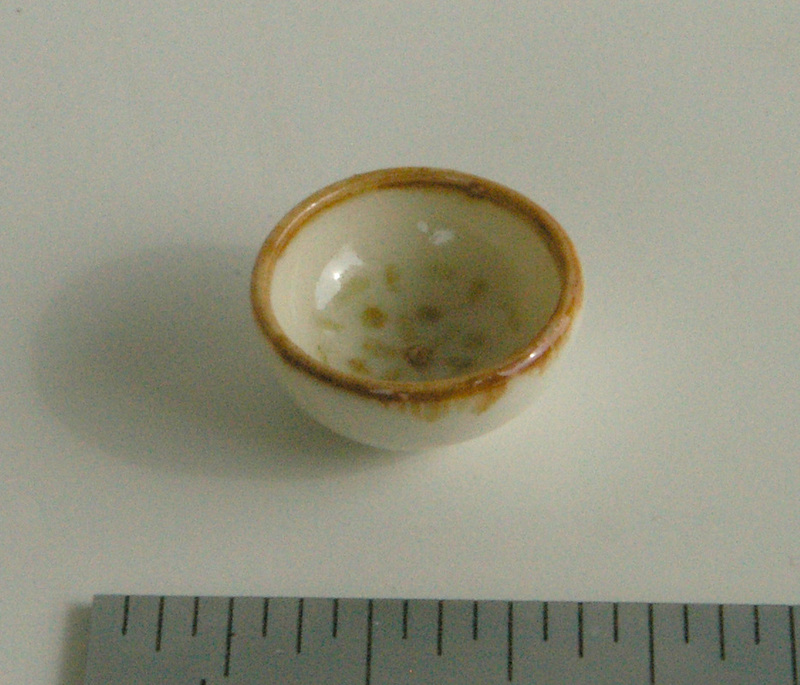 Porcelain bowl in a clear glaze with a caramel coloured design. 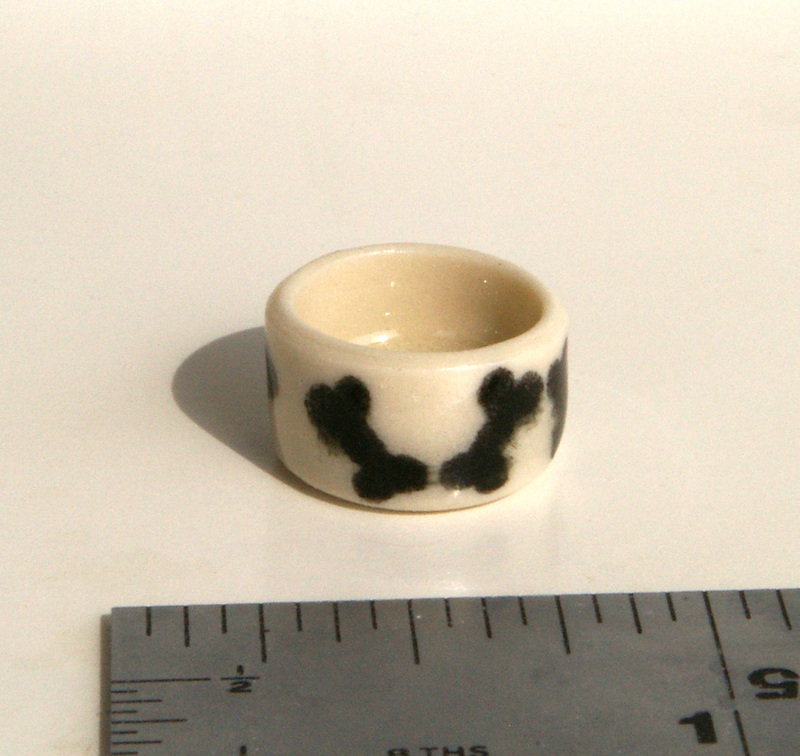 It is 5/8" diameter and is just over 1/4" high. 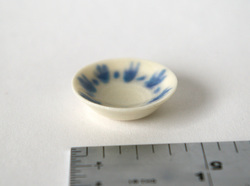 Porcelain bowl in a clear glaze with a blue coloured design. 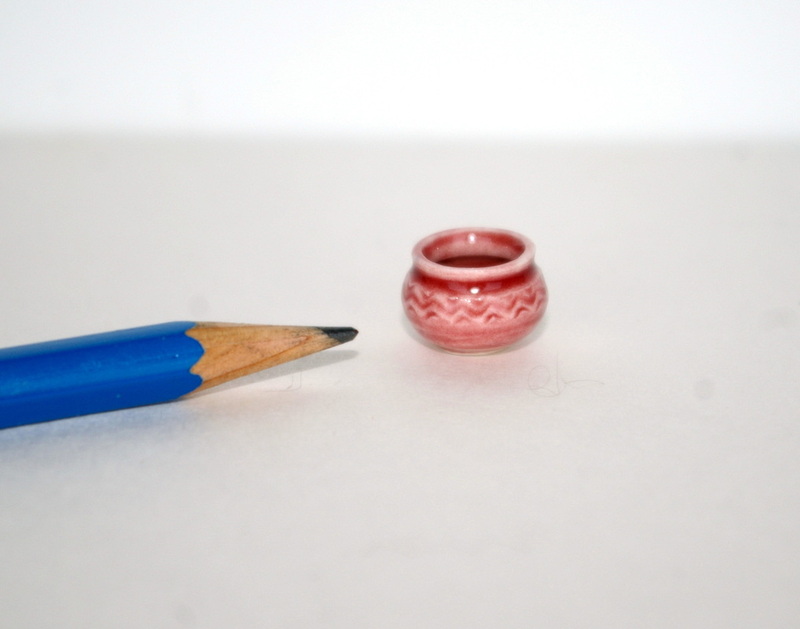 It is 7/8" in diameter and is just 1/4" high. Stoneware candlestick in a cinnamon glaze with real wax candle (included). 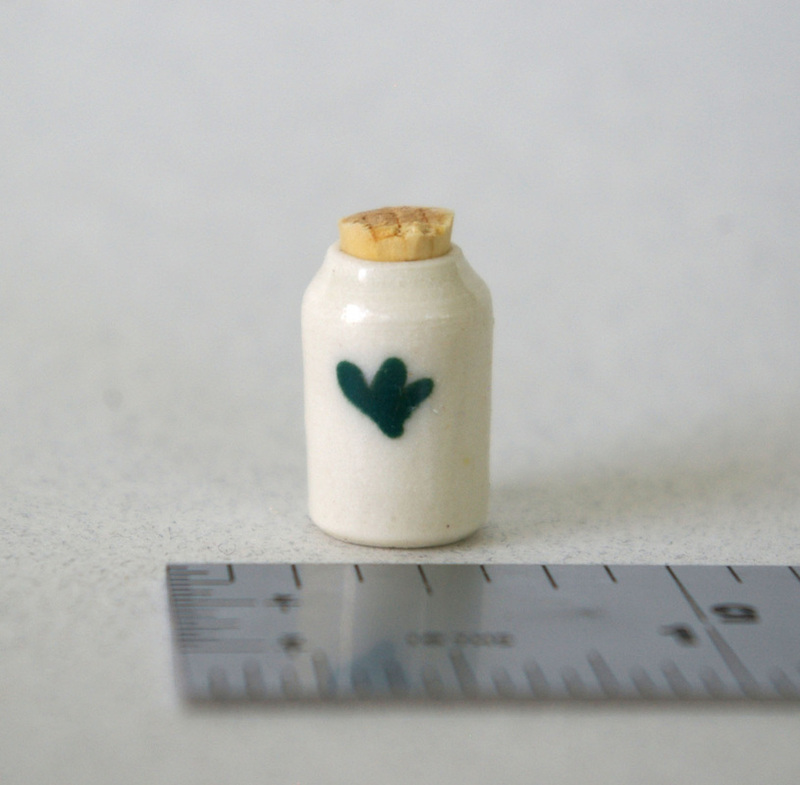 It measures 5/8" in diameter and is under 1/2" high, excluding candle (1-1/4" including candle). Porcelain butter dish with removable lid in a clear glaze with black design. It is 9/16" to handle and is 1/2" high. Porcelain cake plate in royal blue glaze. It measures 1 1/8" in diameter and is just over 1/2" high. This pitcher is made from porcelain clay and is glazed in a rich turquoise glaze. It is 9/16" wide to the handle and is just under 5/8" high. 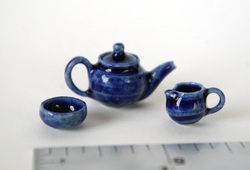 Porcelain teapot, creamer and sugar bowl in a translucent blue glaze. Lid is removable and would actually pour if not for surface tension. 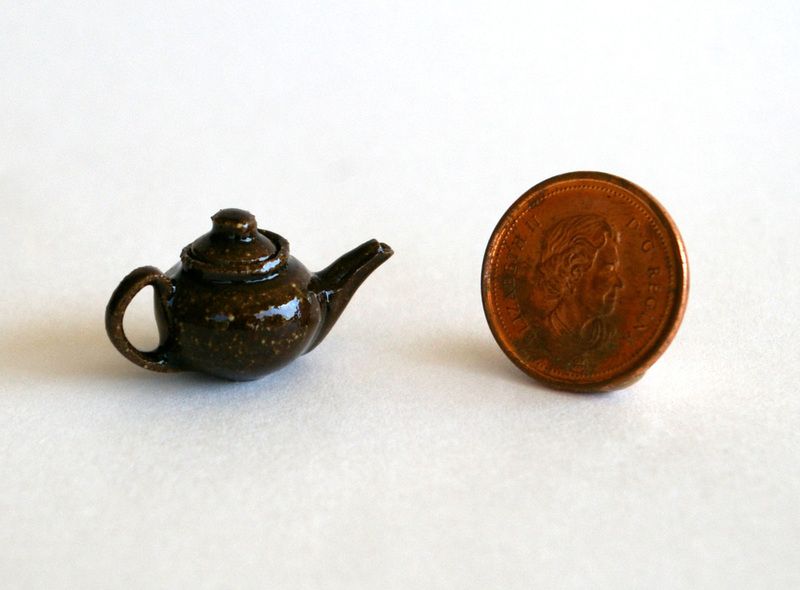 Teapot measures 1" handle to spout and is 9/16" high. Large bowl with a translucent blue glaze. 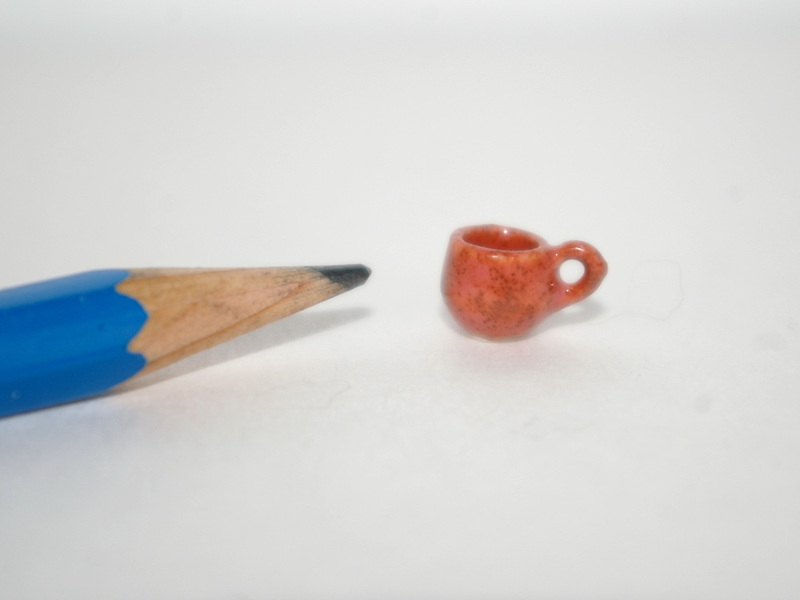 It measures just under 1" dia. and is 7/16" high. Goblet in a transluscent teal glaze. It measures 5/16" in diameter and is 7/16" high. Porcelain mug in a cinnamon coloured glaze. 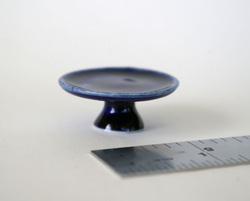 It is 5/16" in diameter (7/16" to handle) and is under 5/16" high. 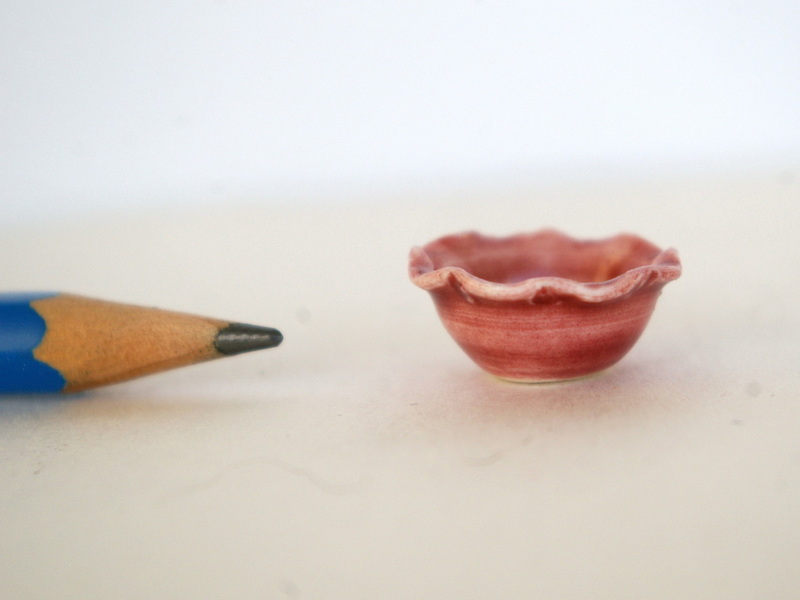 Fluted bowl in a rich crimson glaze. It measures 3/4" in diameter and is about 5/16" high. White bottle with a green design. 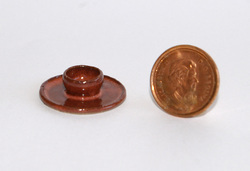 It is 5/16" in diameter and is a mere 5/8" high, not including cork. 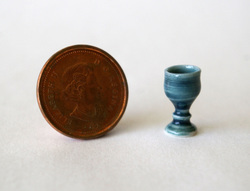 Goblet in a transluscent teal glaze. It measures 5/16" in diameter and is just over 1/2" high. This is a small dip dish perfect for chips and salsa or fruit and yogurt, your choice. It is 13/16" dia. and 5/16" high. This is a single piece, bowl is non-removable. 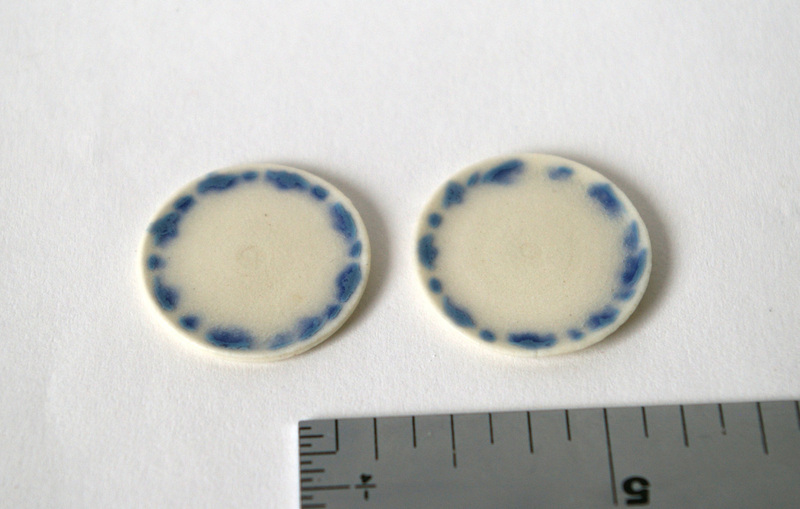 Here is a rare (for me) set of matching porcelain plates with a blue edge design. 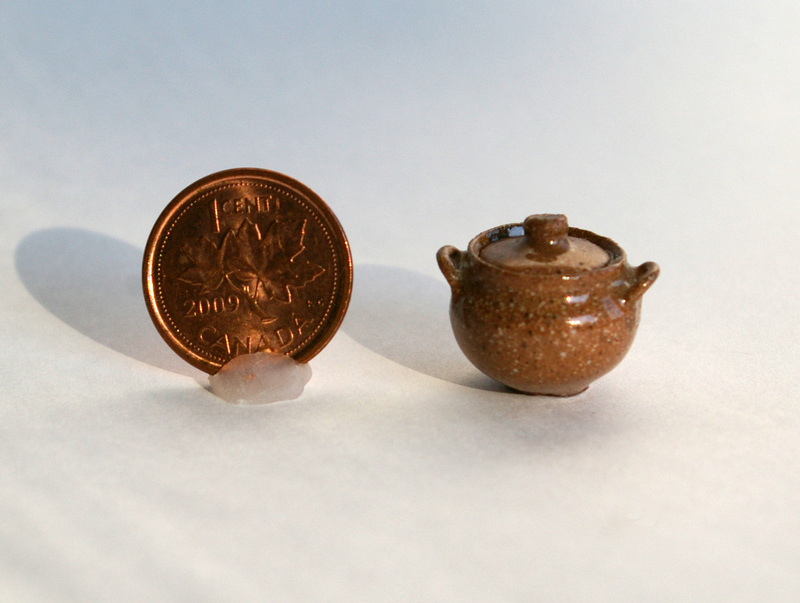 They each measure 13/16" in diameter and are an amazing 1/16" high each. Stoneware teapot in a rich brown glaze. 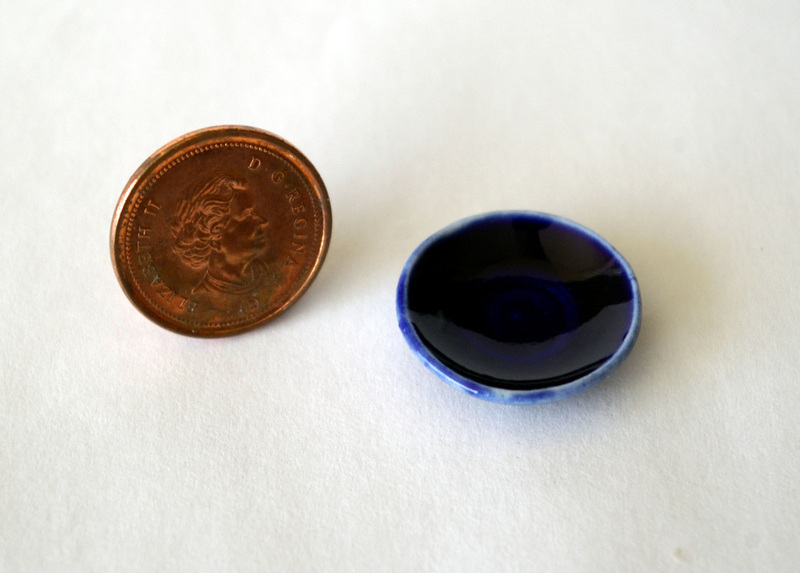 Lid is removable and would actually pour if not for surface tension. It measures 1" handle to spout and is 9/16" high. 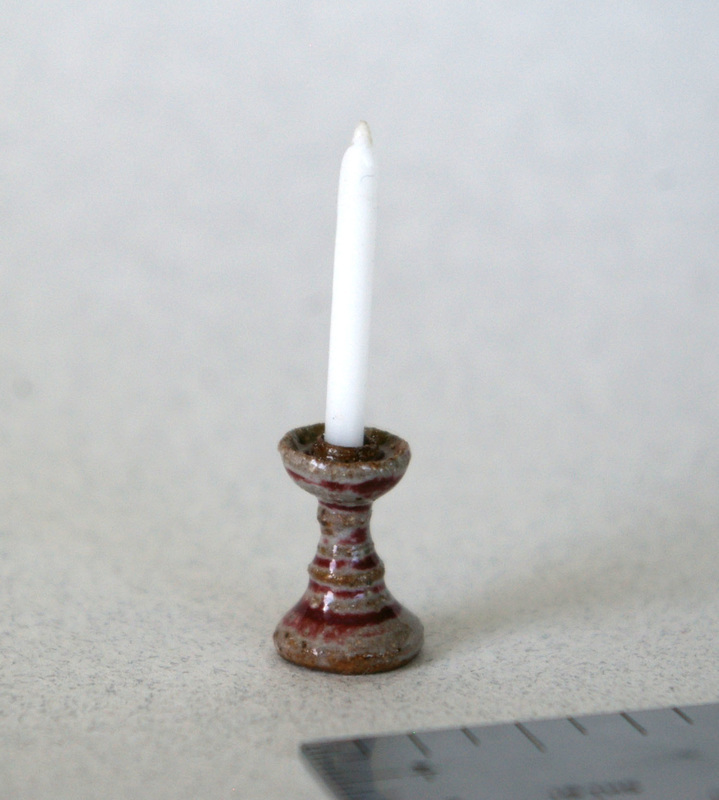 Stoneware candleholder with real wax candle (included) in a burgundy glaze. 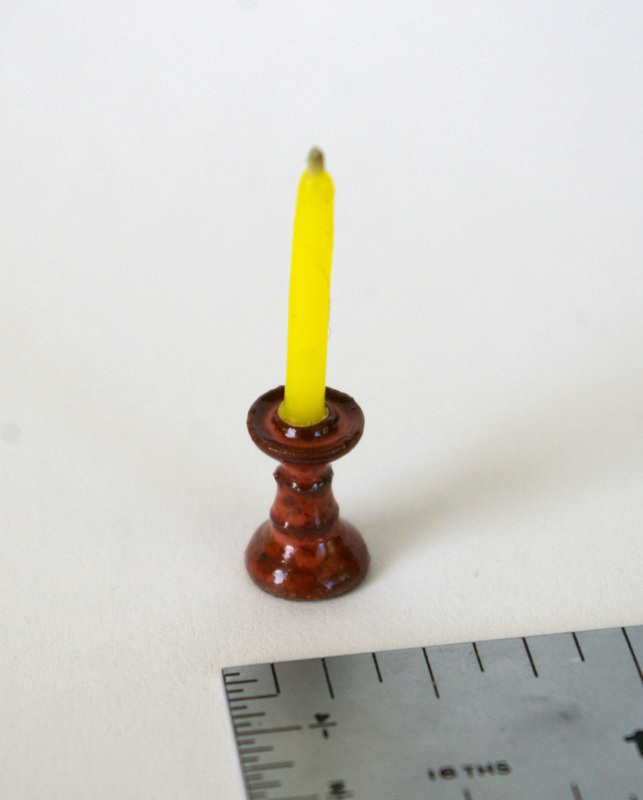 This candleholder is 5/16" dia. 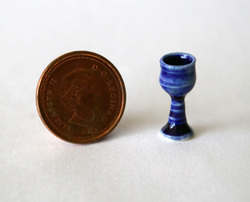 and is just under 1/2" high (1-1/4" to top of candle). 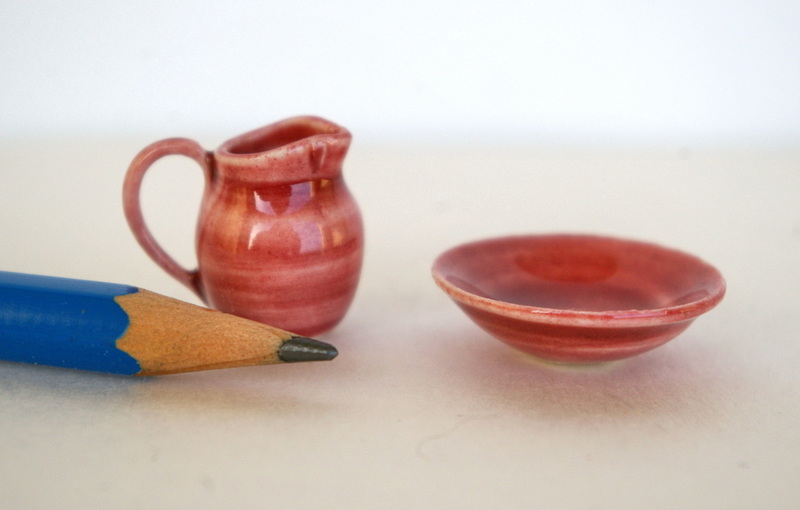 Chamber set in white clay with crimson glaze. These are separate pieces and beautifully shaped. Ewer measures 11/16" high and 1" wide at the bowl. 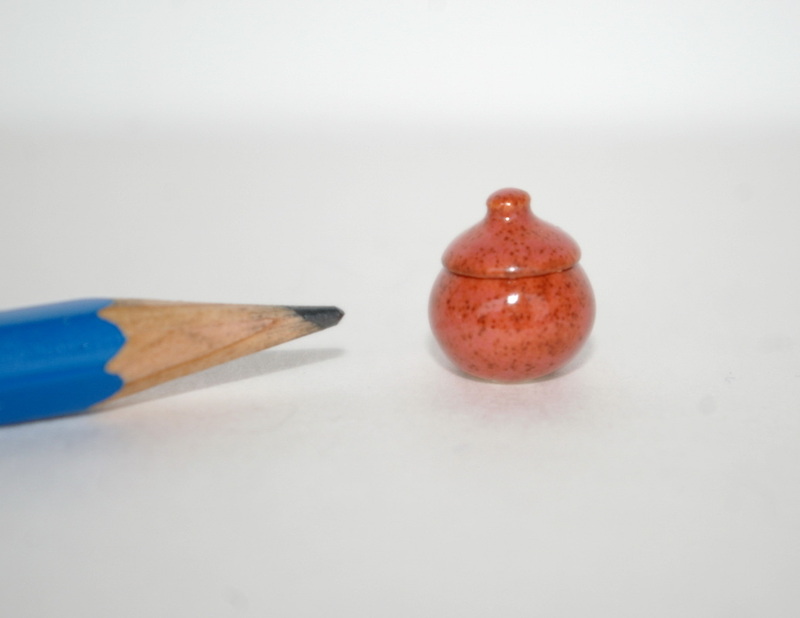 Beautifully shaped bowl with a crimson glaze and impressed design. It measures 11/16" in diameter and 7/16" high. Goblet in rich blue glaze. Size is 5/16" diameter and 5/8" high. Rich blue glaze on white clay, this shallow bowl measures 13/16" in diameter and is about 3/16" high. This piece was made on a full size pottery wheel as are all of my thrown pieces and is clear glazed with a light brown design. 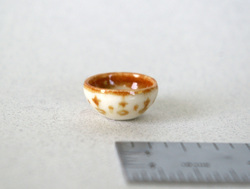 The bowl is perfect for your miniature kitchen or any scene. It is 5/8" wide and about 1/2" high. 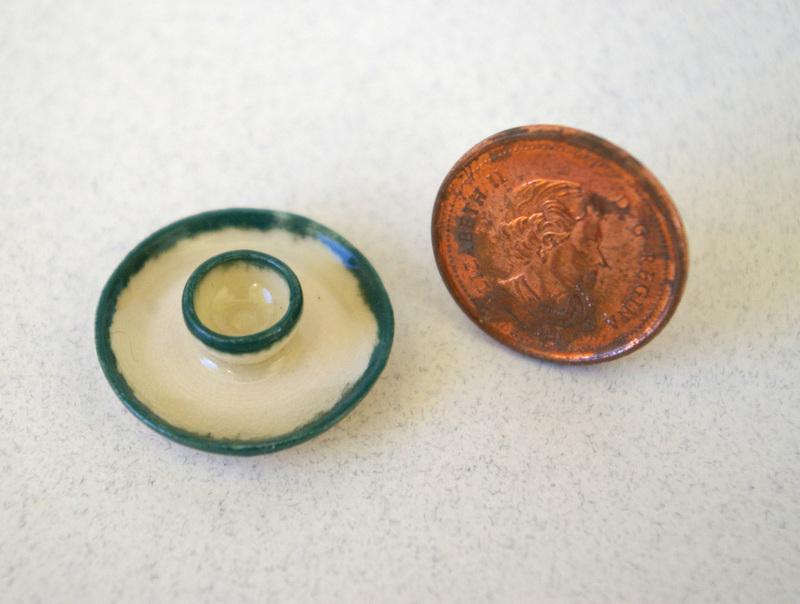 Hand thrown casserole dish in a clear glaze on stoneware for your mini kitchen. The lid is removable. It measures 5/8" diameter by 5/8" high. 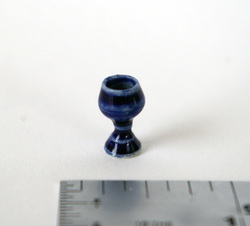 Perfect for your miniature castle or ceremonial scene, this goblet is glazed in a translucent blue glaze. It measures just under 5/16" diameter and is 5/8" high. Platter in clear glaze with black edge design. This piece is 1 3/16" in diameter (1 3/8" handle to handle) and 3/16" high at (handles). 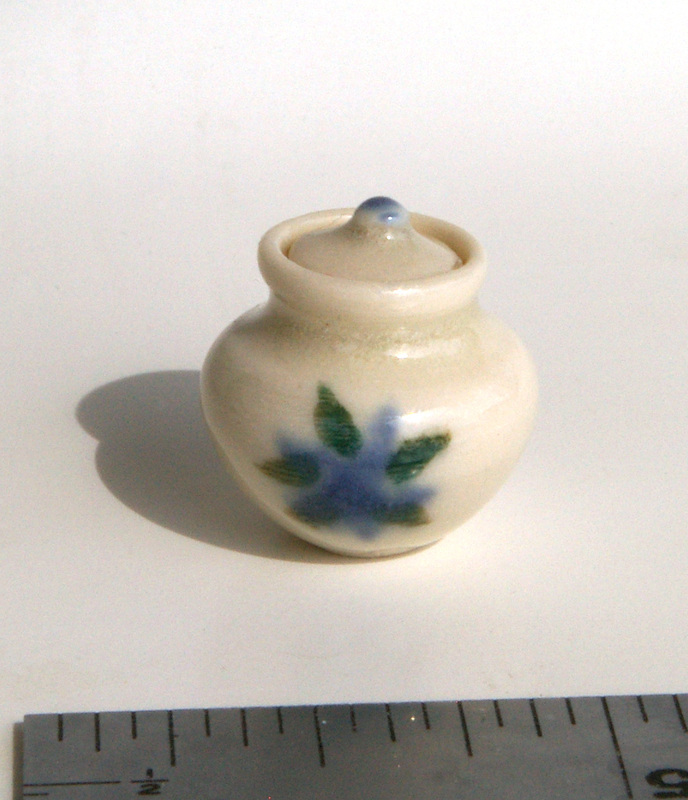 Beautiful lidded jar with flower decoration, this piece measures 5/8" wide and 11/16" high. 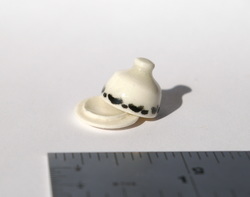 The lid is removable. White pitcher with blue floral design. 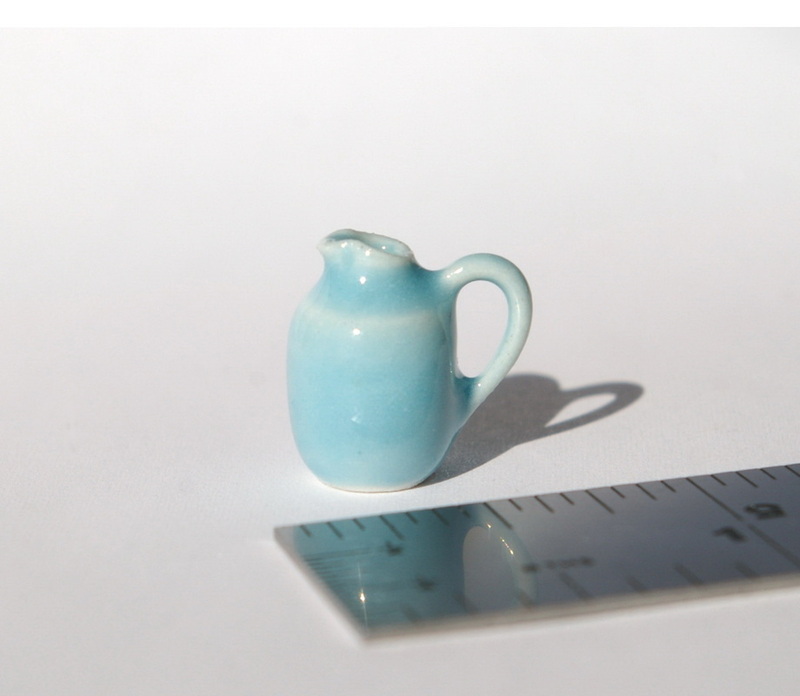 It measures 3/8" in diameter (9/16" wide from handle to spout) and is 1/2" high. 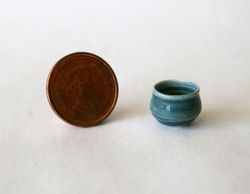 For me, making two items the same is a rare thing but here are two bowls that go together really well. 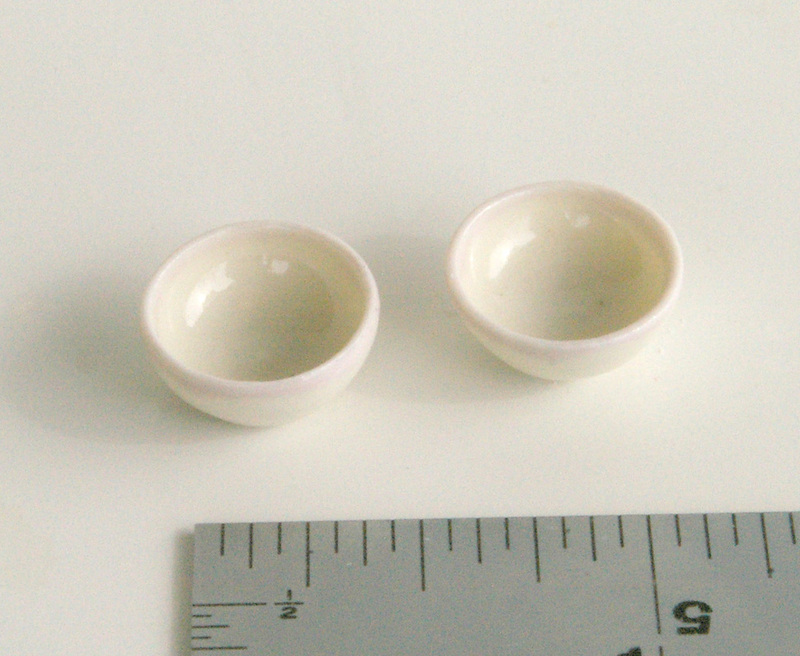 They are glazed in a clear glaze with a faint pink edge. Each are 9/16" wide and 1/4" high. This dip dish is white with a green edge design. 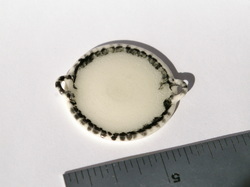 It measures 7/8" in diameter and 1/4" high. The bowl is non-removable. 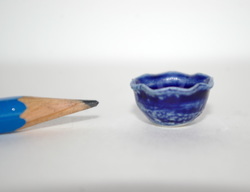 Fluted bowl in a rich blue glaze. 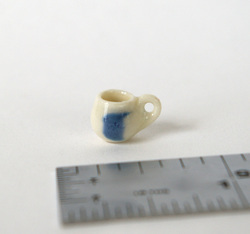 This piece measures about 3/4" wide and 3/16" high. What mini house would be complete without man's best friend? Of course, this friend has to have a bowl for himself. 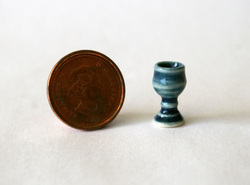 This piece measures 3/8" in diameter and is barely 1/4" high. Cinnamon coloured glaze on white clay. It has a removable lid and measures 7/16" across and 1/2" high. 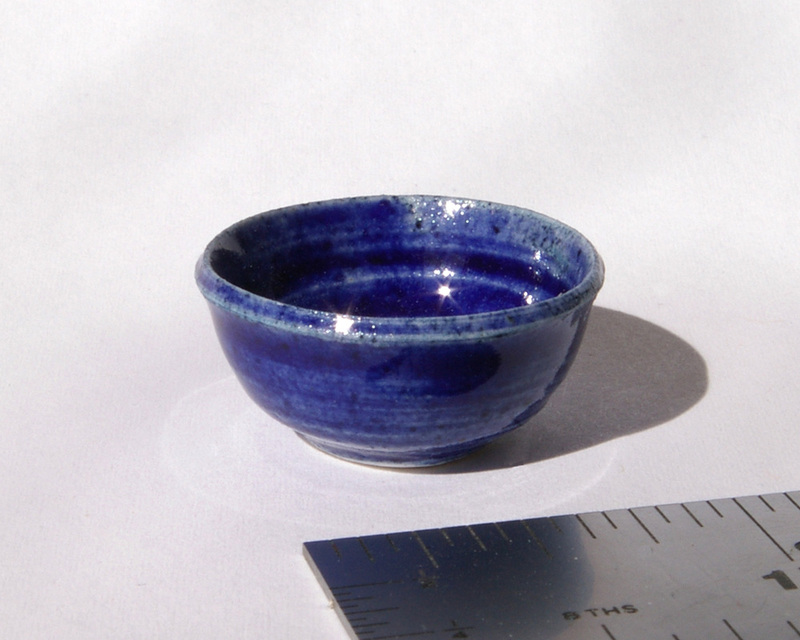 Small bowl in a rich teal glaze. It measures 1/2" across and 3/8" high. 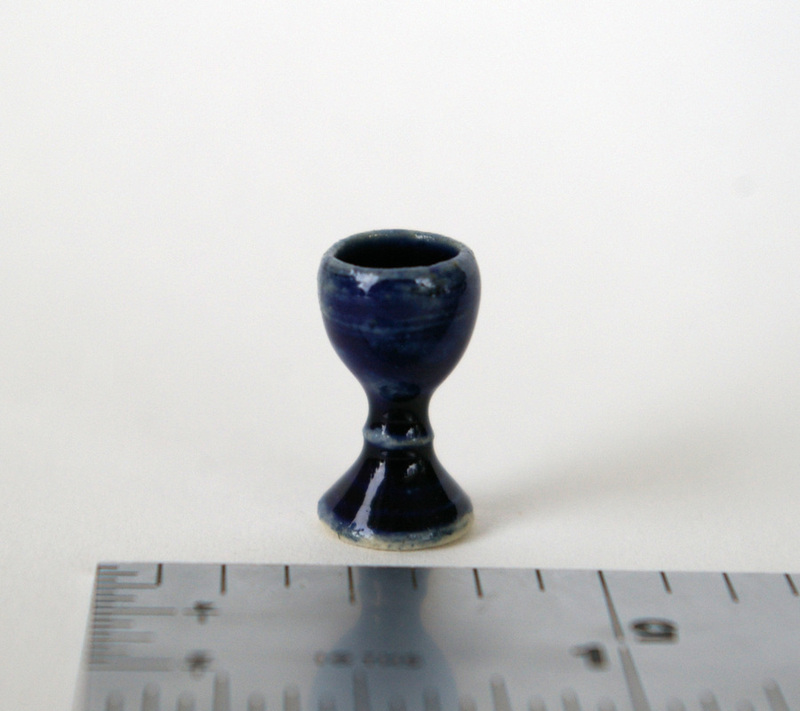 Lovely goblet in a rich blue glaze. It is 5/16" across and 1/2" high. Brown Betty teapot with removable lid. 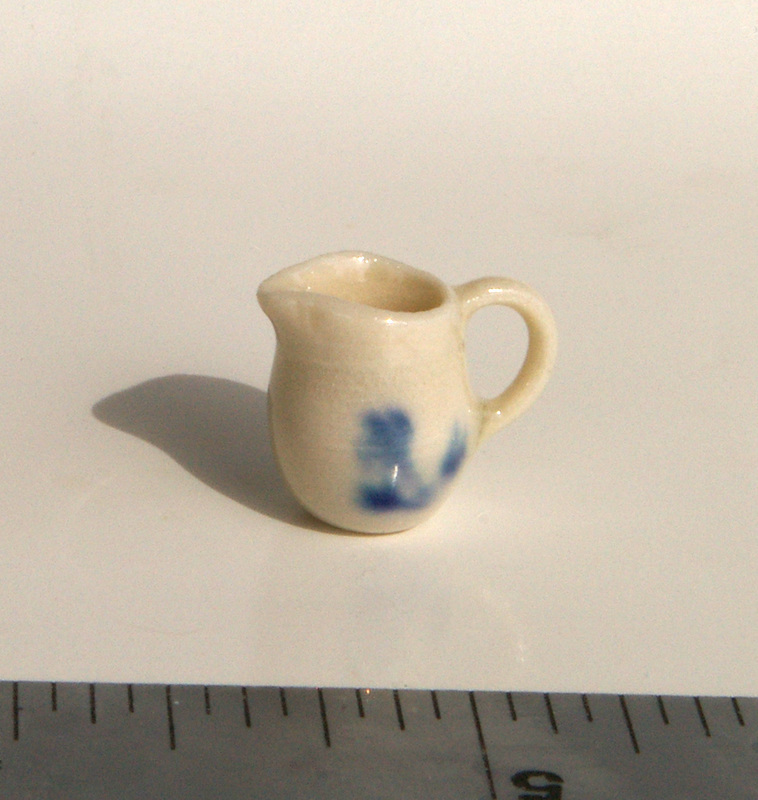 This one is 9/16" in diameter (1" across handle to spout) and 9/16" high. Porcelain butter dish with a translucent teal glaze. Lid is removable, ready to accept a mini pat of butter. It measures 7/16" dia. and 5/16" high. Dip dish in stoneware clay with a cinnamon coloured glaze. It measures 15/16" dia and is just over 1/4" high. It's just waiting for chips and salsa! Pitcher in porcelain clay with a clear glaze and blue decoration. It is 3/8" dia. (9/16" wide from handle to spout and is 7/16" high. Postage has gone up yet again and I regretfully must increase my postage. I do ship as economically as I can and this means that oftentimes, I cannot track your item. 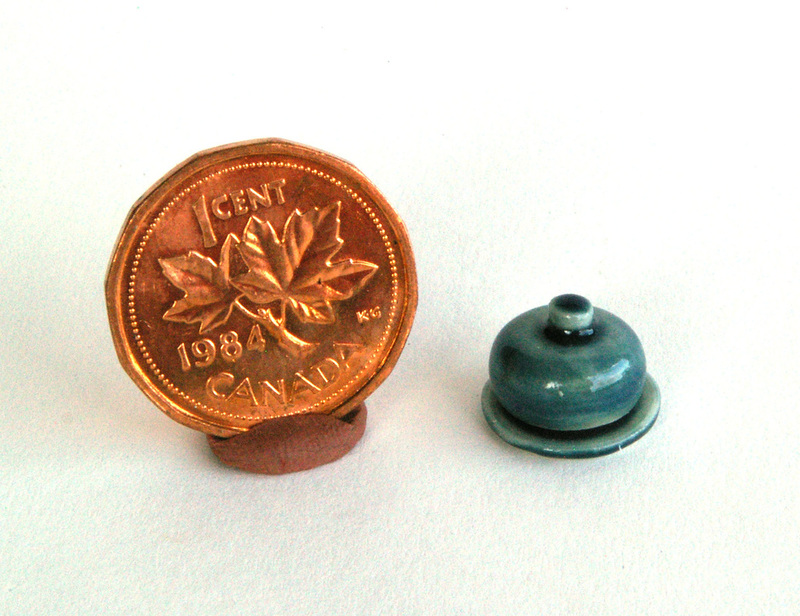 Shipping for most of these items is $1.75 CAD for shipping within Canada and $4.30 CAD for shipping to USA. For international buyers, please inquire and I will calculate exact shipping to your country. 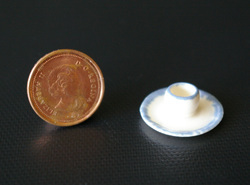 Most of the time, it is about $7.50 CAD. Of course, I wlll combine shipping for multiple items.